Double Chocolate Brownie Cake is an easy homemade chocolate cake recipe that has a brownie-like consistency, and is all about the CHOCOLATE! “All you need is love, but a little chocolate every now and then doesn’t hurt.” That’s one of those sayings I just love, probably because it’s about chocolate, and well, I love chocolate! When I’m in the mood for chocolate, I’m usually not picky. You name it, I love it… like Chocolate Molten Lava Cakes, Simple Chocolate Cake with Buttercream Frosting, or Triple Chocolate Brownies. It’s rare to come across a chocolate dessert that I DON’T like! Thanks to my friend Chloe, I was recently introduced to this Double Chocolate Brownie Cake. Double Chocolate!!! Did you get that? Not only is it double chocolately, and brownie-like, it is one of the easiest recipes I’ve made for a unique homemade (semi-homemade, actually), chocolate cake. You start with a box of Devil’s Food Cake mix, and then doctor it up with a little sour cream and a few other things, namely chocolate chips. Can I give a little advice here? Spend the little bit of extra money to buy higher quality chocolate chips (Ghirardelli is my personal favorite), and by all means, try to avoid generic chocolate chips. They are not created equal, and I know this from personal experience! The Ghirardelli chips make a big difference in the outcome, so it’s worth the extra dollar or so you’ll spend on them (and no, they aren’t paying me to say this!! 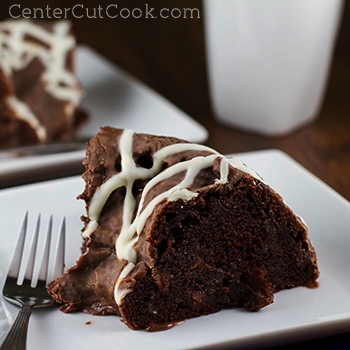 This particularly easy cake recipe is made in a bundt pan so that it’s shaped in a ring. If you don’t have one, it’s a worthwhile investment. A bundt pan is the pan I use every time I make Monkey Bread or Pumpkin Spice Monkey Bread, so it’s a handy cake pan to have on-hand. While the cake is baking, you’ll whip up a simple chocolate glaze that gets poured over the cake. And then to make it even more sinful, I melted some white chocolate chips and piped a thin strip on the cake. SO delicious! Serve with a glass of milk, some tea or coffee, and you’re good to go! Spray a bundt cake pan with non-stick cooking spray. With your mixer, combine Devil’s Food Cake Mix with pudding. Add in eggs and vanilla and beat for a few minutes. Mix in sour cream, vegetable oil, and water and beat on high for 3 minutes. Bake for 50-60 minutes or until the cake is cooked through. Allow the cake to cool for a few minutes, then flip the cake onto a plate. In a small sauce pan, combine sweetened condensed milk, milk chocolate chips, and vanilla. Simmer on low until the chocolate is melted and the glaze is smooth. Melted white chocolate chips according to package directions. Pour the melted mixture into a ziplock bag. Cut the tip and drizzle white chocolate all over the cake.